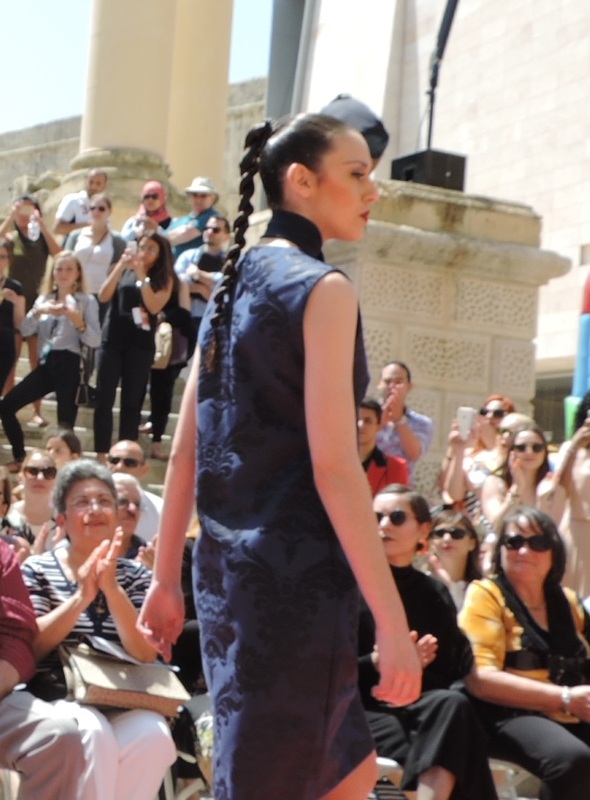 Today marks the opening of the Mercedes-Benz Malta Fashion Week and Awards. It was held at Republic Street,Valletta and the weather was fantastic. 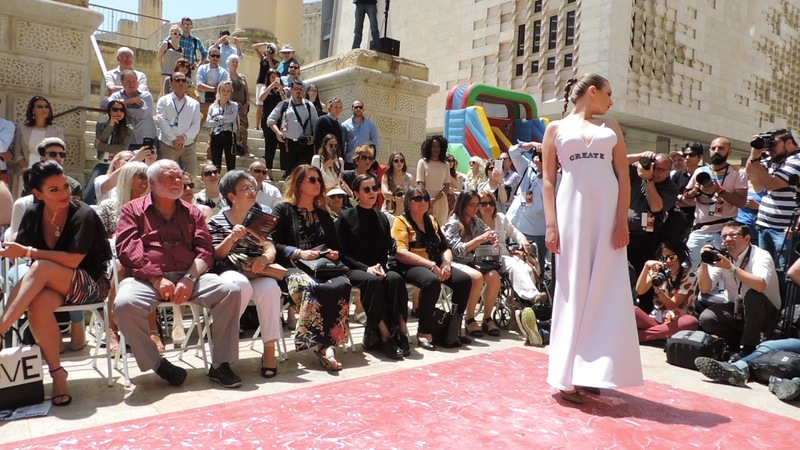 7 new local and foreign designers showcased their designs today to the public for the fist time. The designers are: Lukka Pizzuto, Maria Cutajar, Mari Ahoy, Giulia Pandolfino, Nathan Micallef, Malcolm Cremona and Gabrielle Fenech. The first to showcase his designs was Lukka Pizzuto. His collection is called 'Night Mist' and used dark shades such as blue and black. The collection consists of waistcoats, coats and blazers. Lukka has designs for both man and woman. 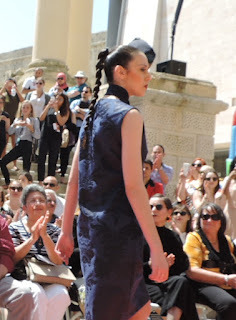 The second designer was Maria Cutajar. Her collection is called 'Summer Breeze' and she used bright and contrasting colours such as white, purple and yellow. Maria was inspired by ripples of the sea and the wrinkled breeze created on the sea. The soft fabrics she used represent the wind and the layering of the fabrics represent the ripples of the sea. Mari Ahoy was the third new designer for the day. Mari is from Finland and was inspired for her collection by Nordic designs. In her designs she made a search of adventure and curiosity, these are seen in innovative cuts and lined blurring garment types. The collection is named 'Form follows feeling'. The fourth designer was Giulia Pandolfino. Her collection is called 'Island Swimwear', her swimsuits are a debut collection called Active Allure. It is inspired by sports luxury mixed with lingerie influences along with repetitive gold strappy details. The next designer was Nathan Micallef. He is currently living in London and gets his inspiration mostly from everyday life experiences and surroundings. He likes to take the viewer on a journey to understand his point of view. While making his clothing accessible he tries to make the wearer feel confident through clothing. The sixth designer was Malcolm Cremona. Malcolm usually he has both female and male clothing but in this collection he wanted to focus more on feminine fashion. With his collection he feels that when women wear his clothes they can be inspirational and give inspirational messages for life through their garments while being beautiful. Some of the inspirational words on his garments are: dream, imagine, believe, create, inspire and achieve. The final designer for today was Gabrielle Fenech. 2016 is the 30th anniversary from the Chernobyl nuclear explosion. Gabrielle's collection is called 'Pripyat' named after the village that hosted the nuclear plant in Ukraine. She has a high level of craftsmanship and attention to detail.